Santa is coming to dinner. It's in the evening with the lights down low. Please help yourself to a plate, napkin and flatware. I will serve the salad and hot apple cider at the table. I love my feather tree. 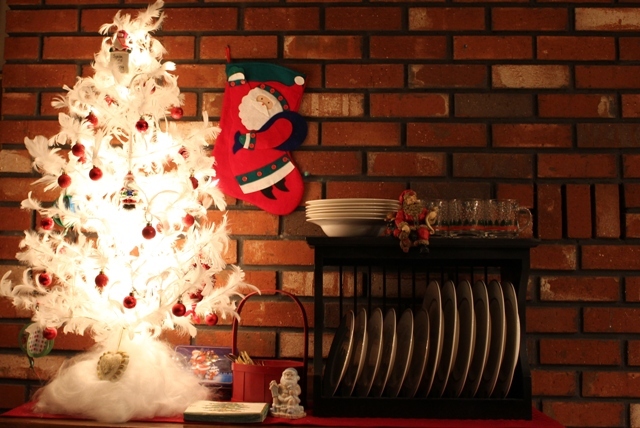 This year, I put my feather tree in the dining room/kitchen. 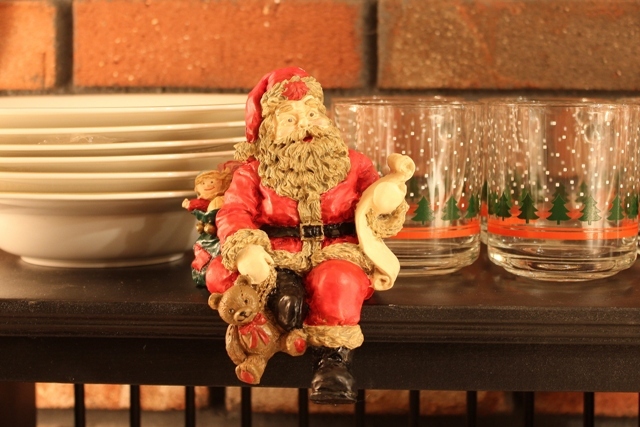 Santa is a stocking hanger. But he doesn't get used anymore. Little children don't live here anymore. Santa, Santa, Santa, Santa, Santa everywhere. I just love the Holidays. The feathers are so delicate and soft to touch. 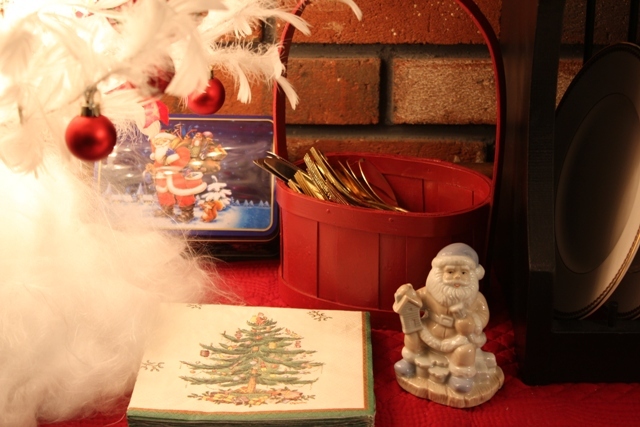 Santa's bringing a gift , but he's lost in the feather tree. 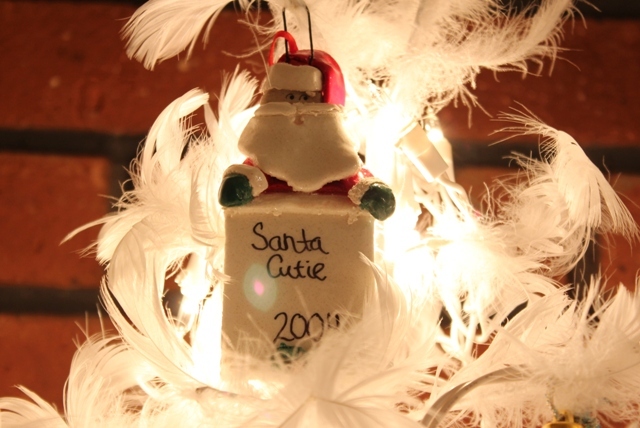 I love the song 'Santa Baby' In 2004 I had this ornament made for my sweetheart. 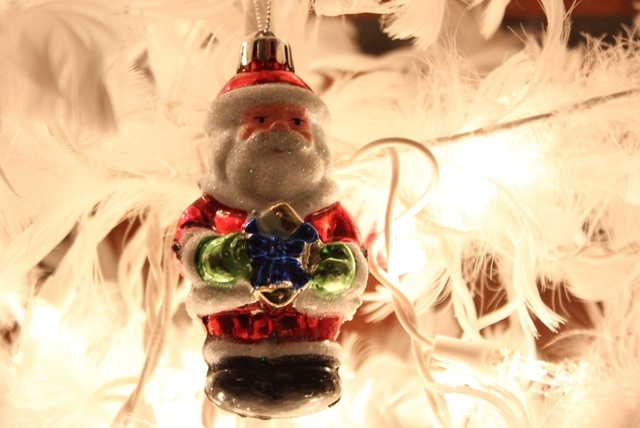 A closer look at the tiny Christmas decorations. There are some paper decorations I made for fun hanging around on the tree. The dishes are a gift from my Sister-in-Law and Husband for my 50th Anniversary just celebrated this summer. Of course. The Holidays need Spode paper napkins. Especially with dessert. I hope you have enjoyed your evening with Santa. It's a Joy to entertain you and please come back real soon. 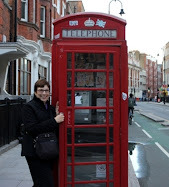 I love to read your comments and please become a follower. 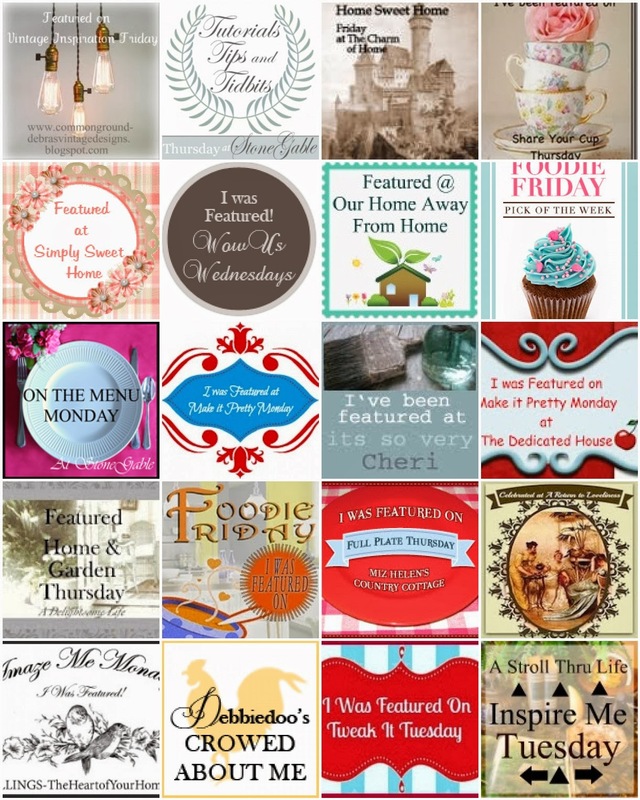 Don't forget to link back to these wonderful blogs for more beautiful Christmas ideas and inspiration. Your Santa's are adorable! 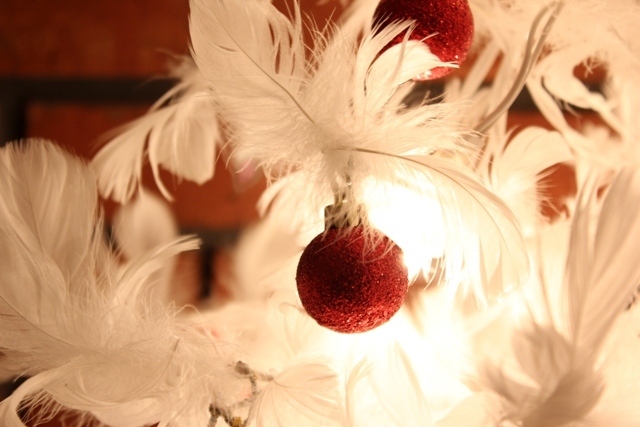 I love the feather tree, everything looks so nice against the pure white feathers. 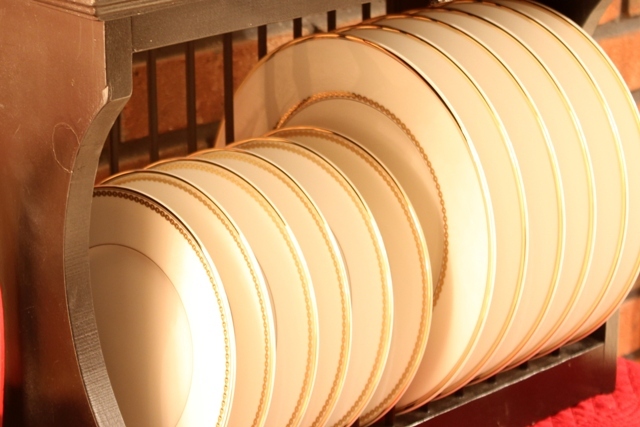 Your dishes are gorgeous. Everything looks very festive!!! PS I am follower now. I just love that feather tree! You have created a beautiful vignette! I love that feather tree , I've never seen one before! Betty, everything looks so pretty and festive. I adore feather trees. Betty, what beautiful dishes and a wonderful way to commemorate 50 years. Happy Anniversary. I love your feather tree too. They are truly magic. 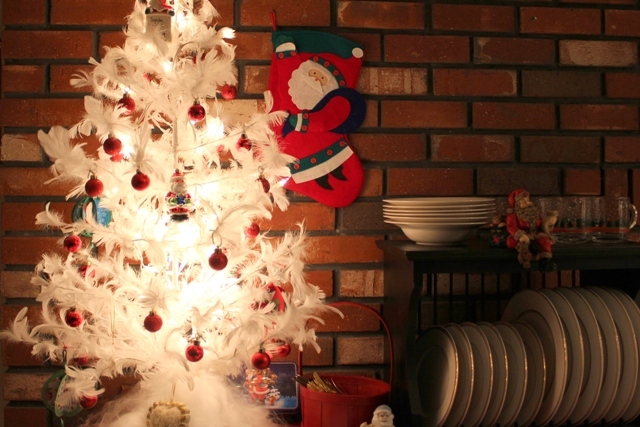 Great collection of Santa's and your feather tree is amazing. I don't think I've ever seen one "in the flesh". 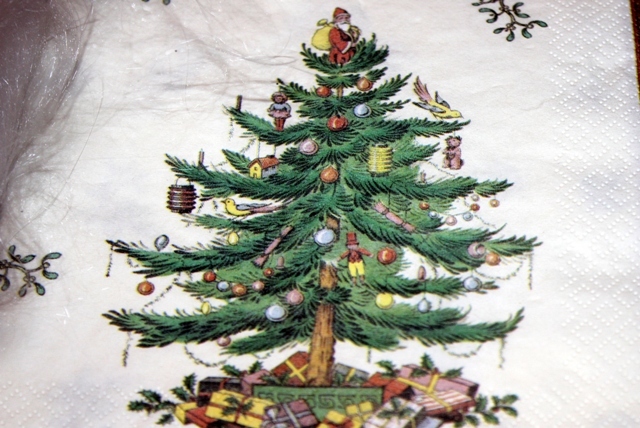 Love Spode's Christmas tree design it's the perfect accessory to everything. Such a fun setting. 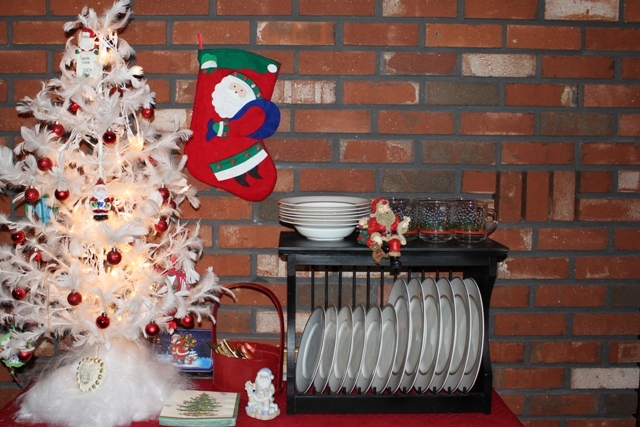 That feather tree brings it all together. 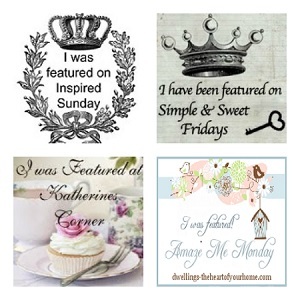 Thanks so much for being a part of Seasonal Sundays. So beautiful!! 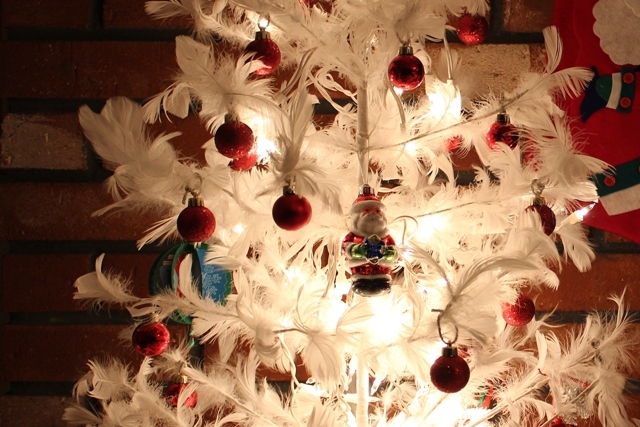 Love the feather tree. I have never seen anything like that before.